As professional Video Converter for Archos, 4Easysoft Archos Video Converter provides an easy way to convert all popular video like MP4, AVI, MTS, MPEG, H.264, MKV, MOV, WMV, VOB, FLV, etc. to Archos supported video and audio formats with best quality. Additionally, powerful editing features with 4Easysoft Archos Video Converter can totally optimize the output Archos video for your preference. 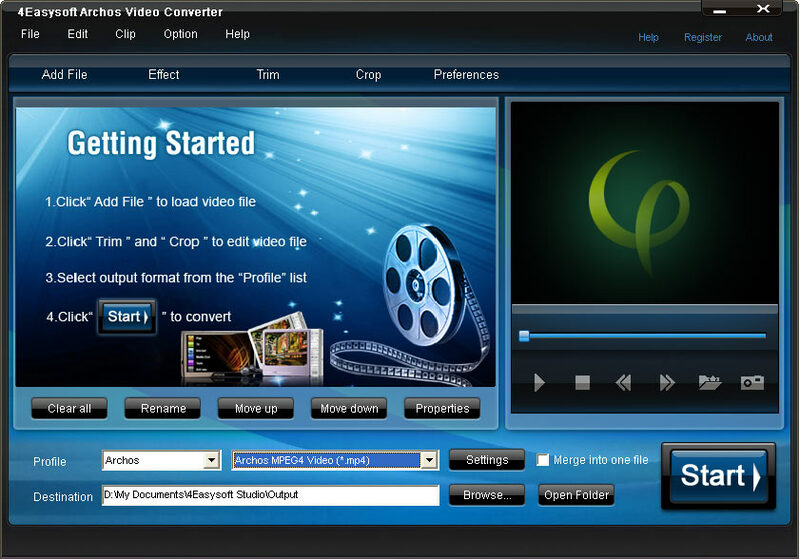 You can use this Archos video Converter to adjust the video effect, trim video length, crop video frame. merge video segments and add video watermark, etc..
4Easysoft Archos Video Converter has the ability to convert all popular video formats to the video and audio formats supported by various Archos players like Archos 705 WiFi, Archos Gmini XS 100, Archos 605 WiFi, Archos 404 camcorder, Archos 404, Archos 504 etc..
With this Archos Video Converter, you can choose to convert all source video to Archos, or you can choose to convert part video from the source video. This Archos Video Converter helps users to join several video together to output one new Archos video freely. 4Easysoft Archos Video Converter helps you to get various output formats from input file(s) in one time converting. 4Easysoft Archos Video Converter enables you to adjust the video visual effect, including the video brightness, contrast and saturation. With the help of 4Easysoft Archos Video Converter, you can split the source video to different video chapters by setting the start and end time. Also this software allows you to remove the black edges and adjust the aspect ratio. Merge several video files together to convert to one Archos video, which can totally double your video enjoyment. The Archos Video Converter helps you add text or image watermark for converted Archos video. You are enabled to adjust the position and transparency of watermark. Choose you preferred audio track and subtitle from the drop-down list. This Archos Video Converter has the intuitive and user-friendly interface as well as the simple process, all which can help you convert video to Archos easily with just a few of clicks. 4Easysoft Archos Video Converter can help you convert video to Archos with super fast speed and high quality because of its advanced decoding technology. How to convert and edit videos for Archos?